Complete 8 main stages and rescue all Mighty Numbers. Complete the game on HYPER difficulty. Complete the game without restarting on HARD difficulty. Complete every SPRINTER! technical bonus. Complete every AMAZING! technical bonus. Complete every QUICK CLEAR! And NICE CLEAR! technical bonus. Complete the game within 120 minutes. Complete the game within 60 minutes. Witness every helping event by Mighty Numbers. Don't attack for the first 30 seconds of a boss battle. Maintain ability boosts for 60 seconds in any stage. Activate all ability boosts at the same time. Attack and absorb enemies 5 times in the air before landing. Complete any stage with a 100% absorption rate. Complete a stage with Call. Complete any stage without using healing items. Complete the City stage without taking damage. Complete any stage without taking damage. Complete any stage without using a ReXelection or missing an attack. Complete the Water Plant stage without being frozen. Complete the Factory stage within 9 minutes with all transformations. Complete any stage with just a single death. Complete any stage by dashing only 9 times or less. Complete any stage by jumping only 30 times or less. Complete any stage with Beck's feet touching the ground for no more than 1 second. Complete any stage without pressing normal movement inputs for longer than 1 sec. at a time. Complete any stage without absorption combos or technical bonuses. Beat the final boss with zero lives remaining and low health. Get defeated by a boss at less than 10% health. Complete Mighty No. 9 on the 9th. Achieve a WONDERFUL! technical bonus. Achieve all FINE PLAY! technical bonuses in the Opening Stage boss battle. Achieve all FINE PLAY! technical bonuses in the Mighty No. 1 boss battle. Achieve all FINE PLAY! technical bonuses in the Mighty No. 2 boss battle. Achieve all FINE PLAY! technical bonuses in the Mighty No. 3 boss battle. Achieve all FINE PLAY! technical bonuses in the Mighty No. 5 boss battle. Achieve all FINE PLAY! technical bonuses in the Mighty No. 6 boss battle. Achieve all FINE PLAY! technical bonuses in the Mighty No. 7 boss battle. Achieve all FINE PLAY! technical bonuses in the Mighty No. 8 boss battle. Achieve all FINE PLAY! technical bonuses in the Prison boss battle. Achieve all FINE PLAY! technical bonuses in the Robot Factory boss battle. Achieve all FINE PLAY! technical bonuses in the Last Stage boss battle. Get more than 10 game overs in your play lifetime. Get 3 100% Absorption combos in a row. Get 5 100% Absorption combos in a row. Get 10 100% Absorption combos in a row. Get 20 100% Absorption combos in a row. Get 30 100% Absorption combos in a row. Get 40 100% Absorption combos in a row. Drop 100m without touching anything. Ascend 100m without touching anything. Achieve an S rank result. Achieve an A rank or higher and 100% Xel absorption rate result. Score 10,000 points in total. Score 100,000 points in total. Score 1,000,000 points in total. Defeated a boss with 1% or less health on Beck. Defeat any Mighty Number without letting them heal. 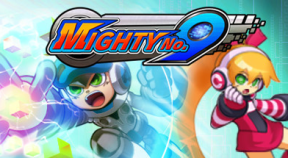 Defeat Mighty No. 5 before he detonates his special attack. Attack the final boss with every single Mighty Number ability. Defeat all Mighty Numbers with only normal attacks. Defeat all bosses with only normal attacks. Complete all themes in single-player Challenge Mode. Complete Boss Rush Mode for the first time. Complete Boss Rush Mode in less than 20 minutes.